First, in a small bowl, make the Special Dipping Sauce by whisking the sugar, water, lemon juice together until the sugar has been dissolved. Whisk the remaining soy sauce, vinegar, ketchup, sesame oil, and mustard. Depending on how spicy you like it, add sriracha (or your favorite hot sauce) to taste. Set aside. You can do this days in advance and store it in an airtight plastic container. When you are ready to cook the chicken, whisk together the all the ingredients to the stir fry sauce in a small bowl. Keep it close to you since you’ll need to use it soon. Set a large pan to medium heat, add the oil, and then add the chicken breasts. Cook until insides are done. Remove from oil (keeping as much oil in the pan) and let cool on a plate and cover with foil to keep moisture in. Turn the heat down to medium-low. With the remaining oil in the pan, saute the onions, minced garlic, minced water chestnut, and minced mushrooms. If the pan looks dry, add another tablespoon of oil. While the vegetables are cooking, mince the chicken the same size of the mushrooms or water chestnuts. Add those back to the pan. Add in the stir fry sauce and gently stir for 30 seconds so that it is incorporated in chicken and veggies. Remove from heat. You’re now ready to serve! Remove leaves of lettuce on a plate. 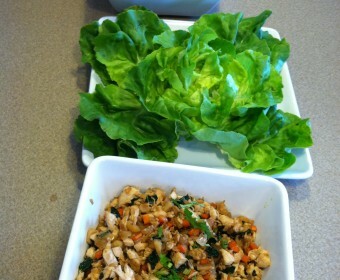 Add the chicken/veggie mix to the lettuce and top with Special Sauce. If you’ve made the Special Dipping Sauce ahead of time, you may want to stir it well (or shake it if it’s in a tightly closed container) like you would a salad dressing. This recipe has a LOT of ingredients – so it’s critical to make the sauces ahead of time. It’s also important to cut all the vegetables & chicken and place them in individual bowls before turning on the stove (also known as “prep”). Then you just need to throw each ingredient in the pan when needed. Mise en place!